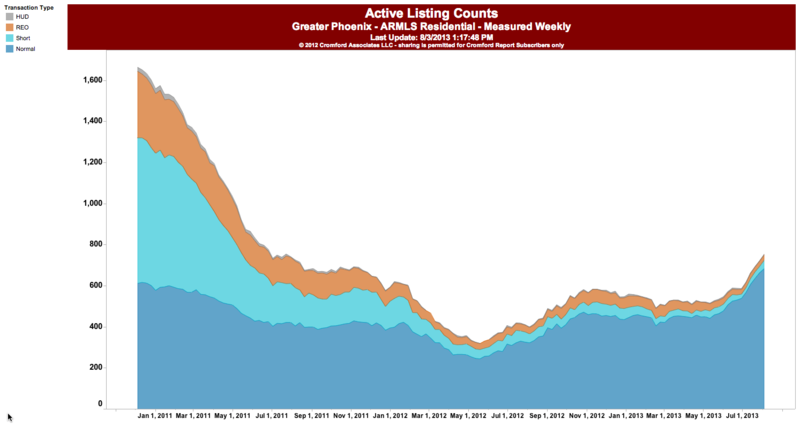 Following up on my 2 posts the last 2 days, “I expect Scottsdale housing inventory to increase sharply” and “Chandler housing inventory could skyrocket”, I wanted to look at more cities to see if I became more or less confident in this style of analysis. Using the same logic as in the last two posts (links above) it looks like housing inventory could skyrocket in Gilbert as well. In fact, total inventory is already back to late 2011 levels (see graph below) and I expect it will continue to rise steeply from here. I’m feeling more confident in this analysis but I’m also looking for anything I may be missing. You can leave comments HERE. Low housing inventory has been the key driver of the rapidly rising home prices we’ve seen for 2 years now. The number of new listings is 1 of the 2 big factors that determine housing inventory (the number of home sales being the other, of course). In these 3 posts, I’ve been focusing on the new listings part of the equation and forecasting its effect on total housing inventory for the 3 cities over the next 12 months.